Trapezoids are ideal side stones for a brilliant cut center stone on a three-stone diamond ring. A pair of step cut trapezoid diamonds will match an emerald center stone perfectly. Trapezoid diamond pairs were created specifically to be mounted as side stones to three-stone diamond engagement rings. 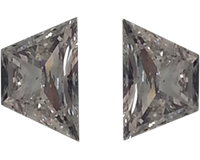 Step cut trapezoid diamondpairs are most commonly mounted against an emerald or Asscher cut center stone, with larger trapezoids being best suited to the longer emerald cut diamond. A brilliant pair of trapezoid diamonds is beautiful with center stones such as radiant and princess cut diamonds. CaratsDirect2U can match diamond trapezoid pairs with almost any center stone. If you are not exactly sure what you are looking for, contact us and we can advise you and find the ideal layout for your piece of jewelry.